The second largest of the Canary Islands after Tenerife, Fuerteventura is located on the eastern side of the archipelago, just below Lanzarote. 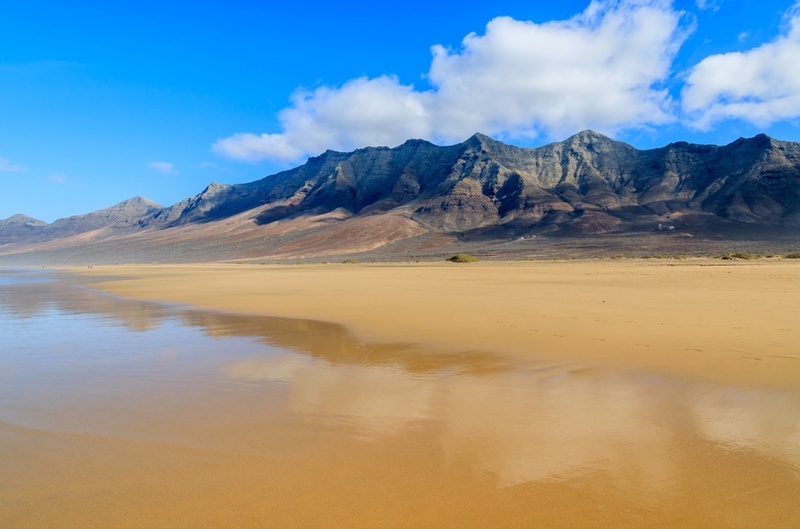 The island’s name can be loosely translated into English as either ‘strong winds’ or ‘great adventure’, both of which are accurate when describing Fuerteventura. Since it’s not one of the most popular Canary Islands, you won’t find a huge choice when it comes to resorts like you will in Gran Canaria, but since the resorts which are on the island are so idyllic, it doesn’t really make a difference. Corralejo in the north of Fuerteventura is the main holiday resort and here you’ll find some of the most magnificent beaches in the whole of the Canaries where you can practise all sorts of wind-based water sports. In addition to the beaches, Corralejo also offers a plethora of tourist amenities, including bars, restaurants, shops, supermarkets and hotels, as well as excursions, water park and golf course, which means you’ll never be stuck for something to do. Caleta de Fuste on the eastern coast is perfect for families and couples looking for a sunshine escape. This modern resort features a golden sandy bay, a harbour where you can book excursions, various shops and so many bars and restaurants that you’ll be spoilt for choice when it comes to evening entertainment. The popular Fuerteventura Oasis Park is also just a short drive away from this resort. Jandia on the southern tip of Fuerteventura is known as the classiest resort on the island. The place to see and be seen, this resort is home to the breathtaking Sotavento beach which stretches on for a staggering 32km. Holidays in Jandia are certainly centred on soaking up the sunshine and riding the waves at the beach, but there is a handful of shops, bars, restaurants and luxury hotels to explore within the resort, too. As with all the Canary Islands, there are traditional villages peppered throughout the whole of Fuerteventura. A must-visit for anyone who wants to catch a glimpse of Fuerteventura before tourism took over, these villages – such as Morro Jable and El Cotillo – are wonderful places to enjoy a sun-kissed stroll before popping into a local restaurant and indulging in some people watching whilst browsing through the menu. If you’re looking for the ideal place to enjoy a laid-back beachside holiday where you can while away days doing nothing more complicated than working on your tan, Fuerteventura in the Canary Islands is the perfect choice for your next getaway.